This book offers new critical approaches for the study of adaptations, abridgments, translations, parodies, and mash-ups that occur internationally in contemporary children’s culture. It follows recent shifts in adaptation studies that call for a move beyond fidelity criticism, a paradigm that measures the success of an adaptation by the level of fidelity to the "original" text, toward a methodology that considers the adaptation to be always already in conversation with the adapted text. This book visits children’s literature and culture in order to consider the generic, pedagogical, and ideological underpinnings that drive both the process and the product. Focusing on novels as well as folktales, films, graphic novels, and anime, the authors consider the challenges inherent in transforming the work of authors such as William Shakespeare, Charles Perrault, L.M. 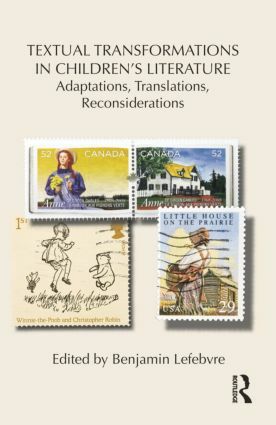 Montgomery, Laura Ingalls Wilder, and A.A. Milne into new forms that are palatable for later audiences particularly when—for perceived ideological or political reasons—the textual transformation is not only unavoidable but entirely necessary. Contributors consider the challenges inherent in transforming stories and characters from one type of text to another, across genres, languages, and time, offering a range of new models that will inform future scholarship. Benjamin Lefebvre is a Visiting Research Fellow at the TransCanada Institute at the University of Guelph and a Research Associate at the Centre for Research in Young People's Texts and Cultures at the University of Winnipeg, Canada.